With an abundance of natural beauty, an A-rated school system, and splendid real estate options, the remarkable community of Estero, Florida, is a great place for homebuyers looking for a vacation home, new primary residence or an investment property. Homes for sale in Estero, which is located in Lee County, include condos, townhomes, homes in golf and gated communities, as well as other single family homes of varying ages, sizes and architectural styles. Among its many points of interest, this family-friendly community is in close proximity to Florida Gulf Coast University, Coconut Point and the Germain Arena. Boasting an abundance of natural beauty, Estero is defined by the landmark Estero River and the charming island of Mound Key. Both of these remarkable destinations afford numerous opportunities for boating, as well as exploring the wildlife and gorgeous vegetation of Southwest Florida. 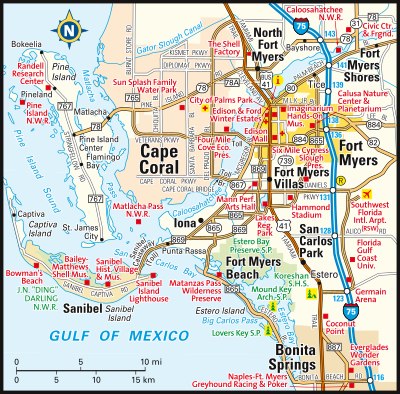 Home to fewer than 20,000 residents, Estero is bordered on the east by Collier County, on the south by Bonita Springs, on the west by Estero Bay and on the north by San Carlos and Three Oaks. Those that call Estero home enjoy easy access to great shopping opportunities at the Miromar Design Center, Coconut Point and Miromar Outlets. There is also a multitude of options for entertainment and recreation in Estero, and all are easy to enjoy year-round due to the near-perfect weather. Just thirty-five minutes from Estero you’ll find several gorgeous white sandy beaches such as Bonita Beach Park and Fort Myers Beach. The Miromar Lakes resort community and all of its wonderful amenities are also easily enjoyed and only fifteen minutes from Estero. In addition to wonderful amenities, impeccable year-round weather and an abundance of dining, shopping, entertainment and recreation opportunities, Estero is also home to impressive real estate options. This suburban community has a diverse real estate market that includes everything from condos and townhomes to single family homes of varying ages, sizes and architectural styles. Home prices vary depending upon those factors and the property’s location and special features, but the median sale price of an Estero home is typically around $309,000. While there can sometimes be exceptions, ordinarily a single family home for sale in Estero will range from around $214,000 to $2.2 million, while condos, townhomes and villas in Estero typically range from $79,900 to $825,000. If you would like more information regarding homes for sale in Estero, please do not hesitate to contact us today for assistance.